GBPUSD is chiefly affected by the UK Industrial Trends Survey – Orders announcement. Moreover, the Pound has gained momentum due to the poll which 52% of people voted against Brexit. GBPUSD has been moving in neutral area for a while. 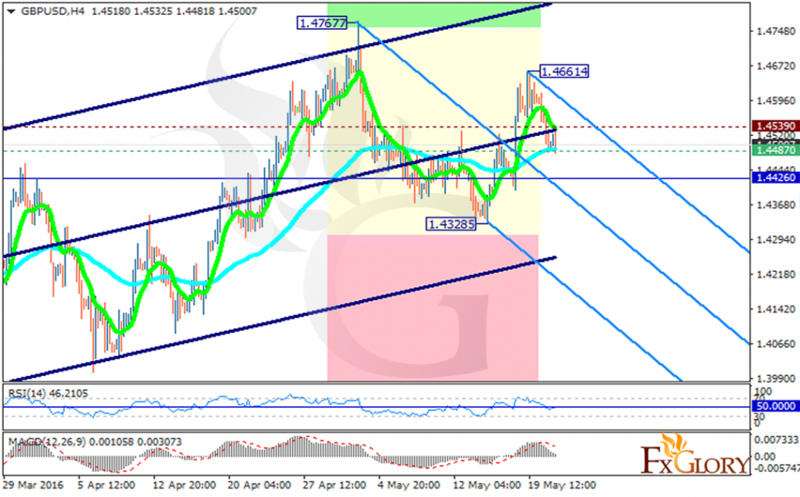 The support lies at 1.44870 with resistance at 1.4539 which both lines are above the monthly pivot point at 1.4426. The EMA of 10 is above the EMA of 75 but is getting close to it in the neutral zone. Considering the long term chart the price is climbing the ascendant channel on the other hand, due to the recent pivot points the price may fall along with the Andrews’ pitchfork. The MACD indicator is showing price growth while the RSI is staying in neutral zone. There is no clear signal for this pair at the moment but the support level breakthrough will lead the pair to lower levels to reach 1.4240 and on the upside, the resistance level breakout will push the price to higher ranges targeting 1.4670.